I’m lazy. I’ve admitted this before, but no one ever believes me. My laziness is part of the reason why I don’t believe in toners or body-lotions, I like to spend those extra precious seconds in bed! Still, lazy is as lazy does, and even though I’m lucky enough to be able to get away without using toners or body lotions, I still have to remove body hair every now and again, and I always hate using two products when I can use just one for the same effect. Enter Gilette Venus, I’ve actually been using these razors for years and years – since they were introduced, in fact. I’ve always liked them, but for a while preferred Wilkinson Sword’s Intuition razors, because they had a built-in lathering agent, which meant you didn’t need a separate shaving gel or foam. My issue with the Intuition is that their soap bars actually make the shaving head very bulky, and this makes it difficult to deal with areas like the back of the knees or the ankles. 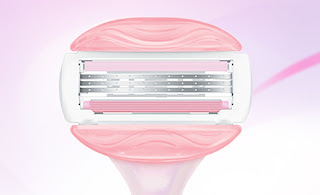 I like the new Spa Breeze version of the Venus because it too gets rid of the need for shaving foam (I mentioned that I’m lazy, right? Did I also mention that I’m cheap? I should have done), and has a really nice light scent that makes it pleasant to use. I find that they don’t leave my skin dry after shaving, and there’s never any irritation, either. They’re also a lot less bulky than the Intuition so they’re easier to use, especially around those “pesky” areas. So, how do you depilate? I have a couple of other things I’ve been using to try and rid myself of random patches of hair, but I keep defaulting to the Venus. See? Lazy. Next Post In a rush! I really like these blades too but I can't get over the fear that I am going to slice myself to ribbons without shaving foam! I still use Venus and I think it rocks. I'm the same type of way. I'd rather got some extra snooze time then lather myself up!